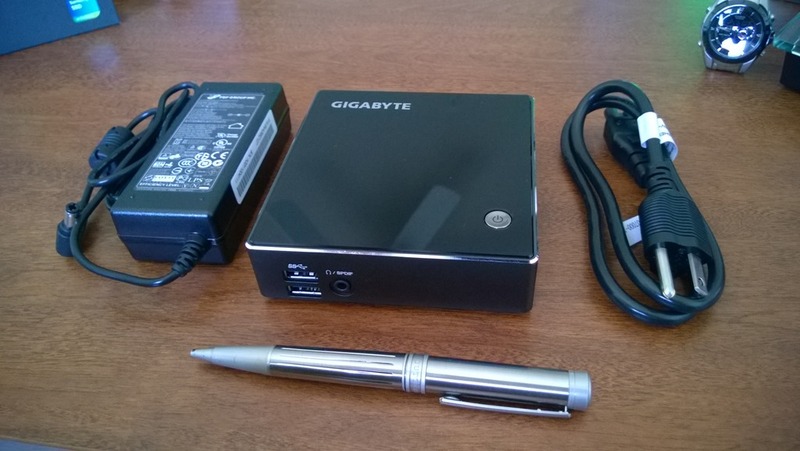 Disclaimer: I wasn’t approached by Gigabyte, neither have anyone provided me any units for review. I am just writing my experience with the unit I purchased recently. As I am getting ready for MEC 2014, I was faced with a question of how should I provide demo environment that I need for my 3 sessions (RBAC, Exchange integration with Lync and SharePoint, and Load Balancing Exchange and Lync 2013), as well as demos out staff will be doing at our booth on exhibit floor. In the past, I have used remote connection to my lab infrastructure, however, when it comes to my demos for sessions, I tend to rely less on connectivity and more on backup recordings as what may fail, always tend to fail during demos. I started exploring my options as I wanted to rely less on my laptop that I will need throughout the event and isn’t going to be shared with my colleagues. While talking to my colleague, I noticed he was sporting a Gigabyte BRIX Projector. I was intrigued at the concept. 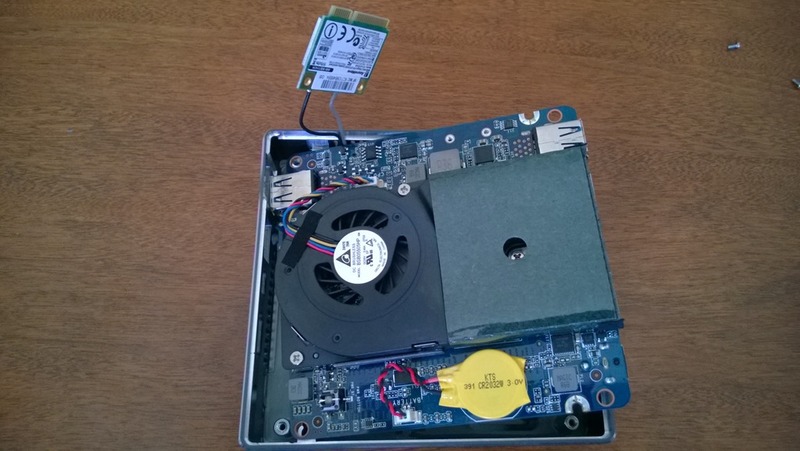 It was a full PC with projector built-in. And since it was DIY PC, you can add RAM and storage to meet your needs. Give it will be somewhat limited as it’s ultra compact PC after all. I then started looking at one that would fit my needs, an i7 processor to take the beating from Exchange and Lync VMs, enough RAM for demos (about 16GB at a minimum) and 512 GB of storage. 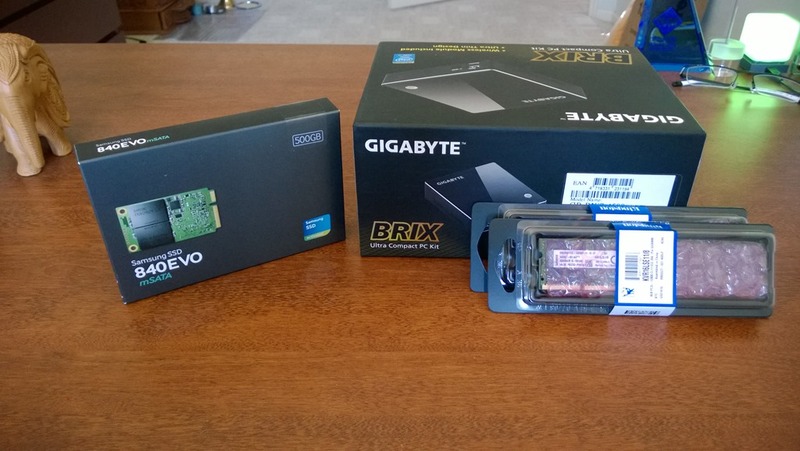 Given Gigabyte BRIX offers a range of ultra compact PCs, I looked at one that would fit my need without robbing my bank. I ended up getting i7-4500 model GB-BXi7-4500, which cost me close to $950 which includes 16 GB Kingston KVR16LSE11/8 RAM (2x 8GB modules) and Samsung 500 GB mSATA SSD drive. 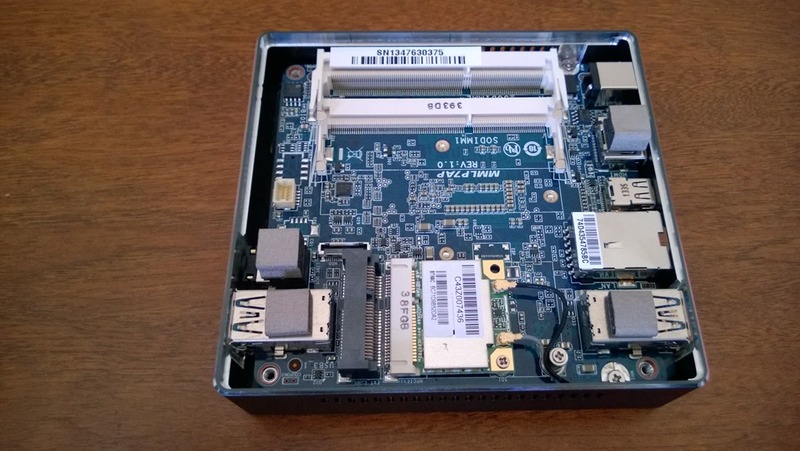 The unit includes 802.11 b/g/n wifi/bluetooth MiniPCIe module installed and ready to go. You can always replace it with different module if you wish to upgrade to 802.11 ac. It was also pretty interesting to see that this little thing packs 4 USB 3.0 ports, one headphone/SPDIF jack, HDMI, mini DisplayPort and a Gigabit LAN port. With memory and SSD in place, I proceeded to installation. The moore’s law always applies. And so it did! I connected power, HDMI and powered it on. I got blue power light on power button but even after a while, I got nothing on my display. So I tried mini display port to HDMI wondering if BIOS was preferring one over the other. Well, I got nothing there either! Now I know both cables were working as I had them running from my laptop and my surface, both were able to project to my monitor fine using same cables! So what could the issue be? Since there isn’t much in this unit, I removed both RAM and SSD. Start up without RAM and SSD didn’t help either! No beeps, no error codes. Power comes on but that’s it! I even tried different monitor as well as HDMI direct to my HDTV. None helped. I figured it’s a bad unit so called Newegg and got RMA going. I received replacement unit the next day. However, to my surprise, it exhibited same symptoms! I immediately opened support call with Gigabyte. After usual troubleshooting including annoying “is power connected” type questions, we finally got to the real stuff. As we discussed details of components I was using, I was asked if I was using approved memory. When you go to support and download list, there is a link to approved memory and SSD drives. I had verified the specs of memory I ordered and I had opted for Kingston memory. It seemed to be exact match based on part number. However, after exhausting all troubleshooting options, we agreed it seems to be a memory issue. I made sure I am getting the right memory and this time I opted for Crucial CT2KIT102464BF160B. I was in time crunch. I had flight to catch next day and had only few hours before I hit the bed. I couldn’t have pulled memory out of it’s packaging and put it in the Brix unit any faster. I had done some research on internet about the display issue in the meanwhile and read somewhere that Brix prefers Mini Display Port at boot and can use both ports after OS is running. Hence, I decided to use Mini Display Port to HDMI connector and connected the unit to my display. After powering up again, however, it still got me no display!?!?!? Before I start throwing things around, I decided to try one last thing, connect HDMI. That was the last option I had not tried after replacing memory. It better work this time I said. And to my pleasant surprise, it fired up! I was looking at boot error because there was no OS installed yet, and that was a really welcome message. I had made progress! I had USB stick with Windows Server 2012 R2 installation media ready. I plugged it in, also plugged in USB keyboard (I could have used wireless keyboard with usb receiver but at this point I didn’t want to waste any extra second on troubleshooting) and fired it up again. At 7:53 pm I was looking at boot message from USB loading Windows SErver 2012 R2 install files. At 8:03 pm, I was looking at login screen! Yup, 4th gen i7, RAM and SSD were working its magic. After a 5 second reboot, I was back on track. Wireless working, updates installed, Hyper-V running and VMs installing! I now have a small but functional Exchange 2013 lab with a Domain Controller, internal and external Windows 7 clients with Outlook, two Exchange 2013 servers and two load balancers for internal and external connectivity. All in a self contained unit that can fit easily in my backpack! 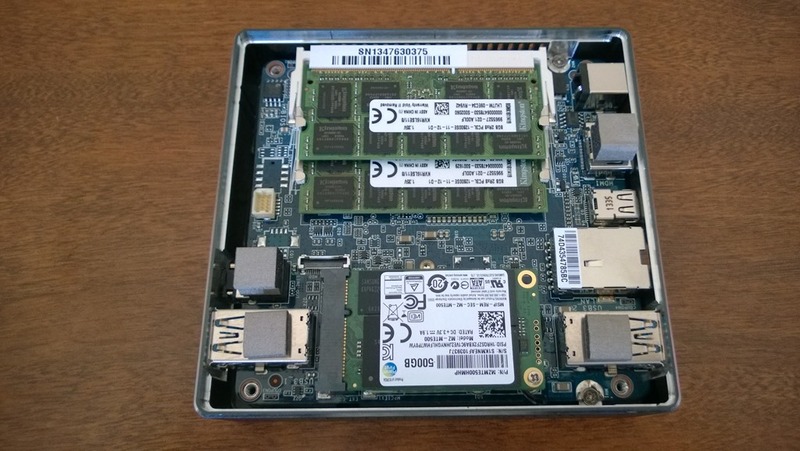 Simple question: I have 2x Brix units … one is the BXi5-4200 and the other is the Pro 4570R. Both show the same issue … when firing up, they will not run Displayport unless HDMI is connected. How do I switch this around. I ONLY want to use Displayport with nothing else connected. One into a Dell 2711 and the other into a Samsung UD590 at 4K. I didn’t have this specific issue. I would recommend checking BIOS if it has any specific settings. If not, I would reach out to support. My display issue was specific to incompatible memory which was resolved when I replace it with compatible memory modules. It seems I’ve just got the same problem with Kingston ECC memory. Thank you for mentioning ECC problem on Gigabyte BRIX.